Just outside the bustling port of Gullsbottom lies the quaint, rural community of Fallowsend, known for its annual harvest festival. Farmers of all shapes and sizes show off fantastical crops.... snap peas, scarrots plumpkins, phantom peppers, and rockali. What will you bring to the festival? 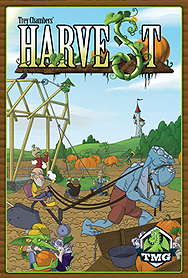 Plant your seeds, tend your crops, and use your buildings well, and you just might win the prize for the best harvest of the season!